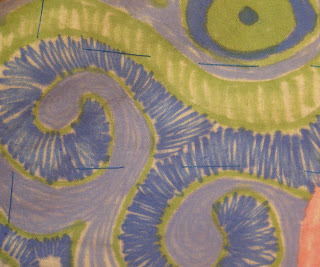 So this week, while still reeling, (in a nice way), from Susan Sorrell's class on fabric painting, I started drawing pictures on fabric, (not exACTly what we did in class, but related), and I started in with the permanent markers again. Here is the unembellished sky from my upcoming piece: "October Bird". Cool texture just with the drawing, I thought. 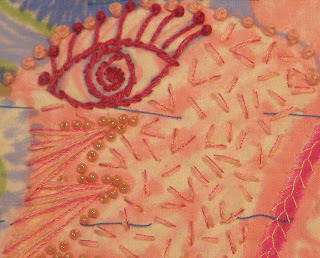 And next we have a getting-there, almost-embellished, view of her eye. O.K. Now we're in heaven. Well, almost. Not quite crusty enough for my liking. Yet. So: as I continue, I will be working with my dear old size 12's. See that feather stitch gracing that hot pink line in the corner? Miles of eensy stitches in thread is more like it for me. Oh, yeah. Now I have to go and finish with all that pink so that I can start on the blue.. and silver.. and trash!